Another attractive solution for protecting your alfresco area from the elements, our channel guide awnings can be mounted in the space between posts to completely enclose the area. They can also be mounted onto the wall either side of your windows if you would like to use them on the rest of your home. They’re available in a wide range of colours to ensure you find a perfect match. If you’re searching for a way of improving the energy efficiency of your home, our side channel awnings online will tick all the boxes. They’re very effective in keeping the heat out of your alfresco space or off your windows during the summer; the same goes for the cold during winter. Our zip awnings actually come with four different methods of operation – crank handle (also known as manual), electric motorised, battery powered and solar motorised. If you aren’t sure which of these methods will best meet your needs, our expert team is more than happy to help. The sleek, modern design of these awnings involves the fabric being locked into a zip mechanism that slides neatly up and down between two side channels. This adds tension to the fabric, keeping the surface taut at all times, whilst the side channels prevent sunlight from passing through the gaps. One of the mains reasons behind the popularity of channel awnings for windows is that they’re highly suited for use in high wind areas. In actual fact, those in our range possess a wind rating of up to 80km per hour. 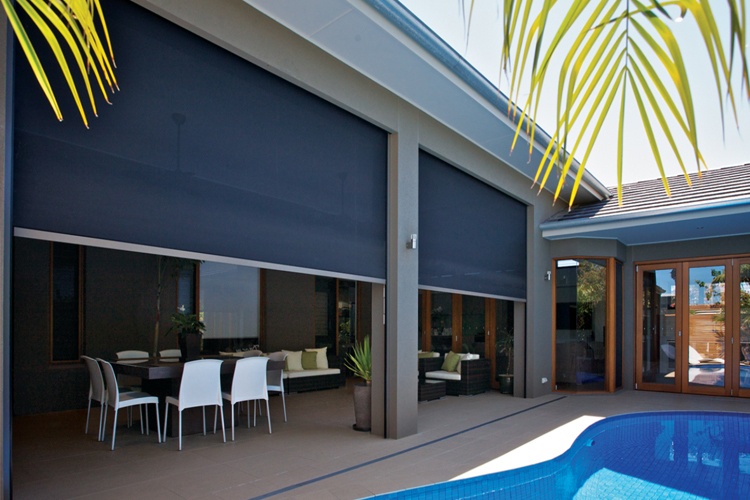 If you’ve always believed that awnings are beyond your reach, it’s time to change your mind!